I have been thinking about this day -- May 5. It’s a tough secondary effect that the layoff fell on a holiday that is associated with partying, fun with friends and tequila. Whether you watch TV or listen to the radio or even go to Safeway there are ad spots and huge displays of Corona, limes, chips and salsa. It's a day to celebrate, si? 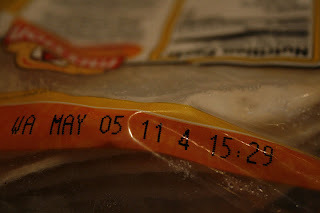 I noticed the expiration on these tortillas was Cinqo de Mayo. I wonder if one day I'll forget what happened on Cinqo de Mayo 2009. It was on this day, May 5, at 10am that I learned that my job was eliminated and so was I. Following the “We're sorry to have to do this” conversation I numbly walked back to my office. I closed my door and looked around at the items on my desk that I looked at every day. I touched the Post-It my husband left on my monitor one day when he stopped by to say "I love you" and my Honolulu Coffee mug that I picked up when I covered the “Forgetting Sarah Marshall” junket in Oahu. 10am my world shifted on its axis when my job evaporated. At 11am we were supposed to be signing the papers on our new home. Picking up that phone to call my husband to say “Don’t sign the papers. I got sacked” was not a call I was prepared to make. As I sat at my desk I avoided eye contact with my co-workers who peeked through the window in my closed office door and gave me the tilted sad face. News traveled fast. I couldn’t deal with having the “I know, I know, so awful” conversation over and over. I swiveled my chair to face the window and called my husband. L. said he was sorry and “We’ll be OK.” We agreed to not buy the house that we both so desperately wanted. There was a part of me that thought “Damn it. If I can’t have the job I love, then at least we’ll have this cool house” but logic prevailed and we made the right (but hard) decision. I can still remember shivering in my office that morning after hanging up the phone with my husband. I was devastated and wondered what I was supposed to do now. Unlike a break-up with a lover, there was no animosity, no urgency. My stuff was not thrown out on the front lawn. I still had access to my office and phone etc. for several weeks. It was all very civilized but awful. I wonder about my life. What if I didn’t lose my job, then we would have bought the house. What if our babies had survived? What would my life look like right now? Could I have done something different? Should I have sensed the layoff coming and worked harder? What would life have been like going to a job I loved, coming home to a house we adored, and swimming in our pool on summer evenings with our babies in their floaties. What would have happened in that life? I don’t know. What I do know is that I survived it and just like L. said-- we are OK. I learned lessons from that day. I think that there is nothing that speaks more to your integrity as a human being than how you react in adversity. As sad as I was, as furious as I was I wanted to be proud of my behavior. When you are fired/ laid off / broken up with, disbelief, anger and frustration can take over. Your first reaction may be something like “Well, go to hell.” Whatever you do, maintain your composure. I am thankful I did. There are little wins in life. Later when I got home I thought about everything that was open-ended, everything I was working on. Our team was scheduled to shoot huge events in two different cities in the upcoming weeks and I realized that I was the only one that had all the contact, travel and important information on all the projects I was working on. It would set the team back if they didn’t have this information. I decided that there were two ways this could go. 1. I could say “Good luck. See ya!” and leave them scrambling or 2. I could do the decent thing and be sure that the team could move forward with as little fallout as possible when I left. I went to Staples and bought a binder. In different tabbed sections I included all the information on every project I was working on including all my contacts. My managers had left it up to me when my last day would be. I had two weeks before my last day but on the Friday following Cinqo de Mayo I met with one of my managers and handed him the binder along with an envelope with my badge and parking pass. He opened the binder and he seemed surprised that I had included everything. “Wow,” he said. I smiled at him, shook his hand and left. I didn’t cry. I finished strong. Immediately following getting fired / laid off or broken up with, the desire to do something rash will be strong. I think this feeling actually is primal. Your ego wants to prove that you still have control. Don’t listen to your primal self at this point. It is a dumbass. Try drugs to see if they numb the pain. Be gentle to your future self. It’s going to be hard enough to get over the pain without also dealing with a.) Being arrested b.) Knowing that you were an impetuous jackass, no wonder they fired you. You get a pass the day it happens. Cry, be angry, take to your bed. The next day you get out of bed. This is not negotiable. Then for the next week you get one hour a day to wallow/ cry / get angry / call your mother and moan about what has happened to you. Then when your allotted 60 minutes is over it’s time to plan for the rest of your life. When a an overwhelming thought pops into your head not within that one hour window, change the thought. Think of the Target commercial with the puppy who tries to swim in his water bowl. Try to think of all the presidents in order. This works to distract you when you feel yourself slipping into the downward “Why me?” spiral. I chose to memorize First Ladies. Julia Gardiner Tyler was the 11th First Lady. After the incident you will want to take to your bed and not get up until noon or so every day and that will only be to eat a carton of Butter Pecan ice cream. This is not the best idea. It’s time to call in the big guns. You need a council, a team of people who will help you become you again. The servers at the small family owned cafe / Starbucks baristas who you see every day when you get out of the house, drink coffee and work on your resumes. It feels like it at the time. You feel rejected and your life as you know it is literally pulled out from underneath you but I promise (unless you do something stupid) that you will survive this. Hold onto this thought when you think it’s too painful to take another breath. I am looking at the clock and it’s just about that time when I got the email telling me to report to a conference room and I knew my fate. I remember how hot my face was and how I was hit with wave after wave of nausea. It's now 2 years later and I can't believe I am saying this but I am happy that it happened. The me from May 5, 2009 would be incredulous hearing this. Here’s the thing. The event happened. It is set in stone. Nothing can change it. The worst has happened. You made it through. You learned lessons. I learned the ones above that apparently the universe thought I needed to learn. I am grateful for that. Think back on the lessons you learned in your life. It was only through the times when you wanted to cave that you discovered what you are made of. 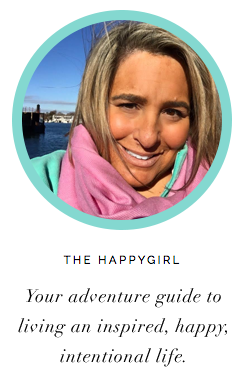 In my case, these things, the losses have led me here as The Happy Girl, to write about how to get your happy back. This is where I am meant to be. Have I discovered the secret to being The Happy Girl yet? Not yet, but I'm working on it. With you. Happy Cinqo de Mayo! I'll be celebrating this day, are you?